THE Environment Protection Authority will be asked to inspect a former pesticide factory site in Fawkner that is contaminated with chemicals found in Agent Orange. Land at 100 and 102 McBryde St was formerly owned by Nufarm Ltd, which produced dioxins and herbicides using chemicals that are the chief ingredients in the substance first used by US troops to defoliate the jungle during the Vietnam War. The council has referred a planning application for two warehouses on the site to the EPA, which has until Thursday to comment. Moreland Council has also called on the EPA to examine a clay cap, placed over the soil in the mid 1990s to entrap the contaminants, to determine its condition. A council report revealed high traces of the carcinogenic chemicals were found at the site after the Nufarm factory closed in 1990. The report also showed a cancer cluster is believed to have existed in the area of McBryde, Percy and Bruce streets during operation of the factory. The Herald Sun reported in June 1990 that 20 cancer deaths were recorded at 18 nearby homes. Brian Snowden, who lives near the property, said he hoped planning permits for construction at the site would be rejected due to health risks. “What the residents are saying is ‘It’s not on’,” Mr Snowden said. An earlier permit application to build warehouses on the lot was denied in 2015, while three similar permits lapsed. An EPA audit conducted in 1995 led to restrictions for the site, including the clay cap being maintained and a requirement that any soil excavated from deeper than half a metre be tested and disposed of within the authority’s guidelines. EPA metro manager Daniel Hunt said the authority was yet to receive a request to inspect the clay cap, but was in discussions with the council and a resident. A plan to redevelop a former Fawkner manufacturing site where the component parts of Agent Orange were once made and stored is heading to the state planning tribunal, despite attempts by residents and a local council to stop it. Proposed for the site are two warehouses on land once owned by agricultural chemical maker Nufarm. Nufarm sold the property four decades ago, but from 1957 to 1971 manufactured a range of chemicals, including two components of the weapon Agent Orange. A Nufarm spokeswoman said that the company had never manufactured Agent Orange. The company also made DDT and arsenic there. The plant was not connected to the sewerage system until 1968. For over a decade when there was spillage of the many deadly chemicals manufactured there, they were simply washed via a stormwater drain into the nearby Merri Creek, an environmental report done on the site for Nufarm in 1995 shows. A residents’ group has been set up to fight the warehouse plan and, with between 50 and 100 members on board, has succeeded in convincing Moreland councillors to reject the plan – despite council officers having recommended it proceed. The proposed warehouses are to be used for the storage of concrete equipment, trucks and tools, and the need to dig deep across all of the contaminated land may not be necessary. But the proposal involves digging into a clay cap previously put over the entire site to protect people from chemicals that had leached into the soils. The planned warehouse’s drainage would see a new sewer dug that would need twin 25-metre-long, two-metre deep trenches dug. 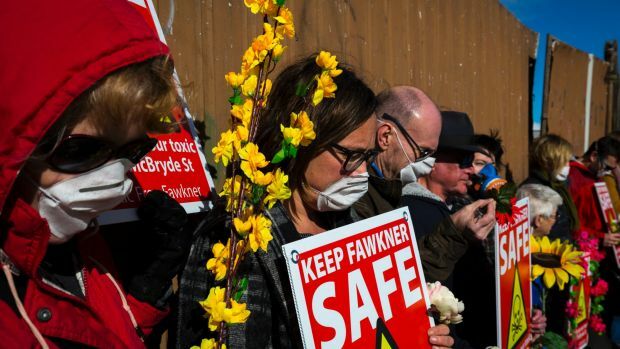 The residents’ group, Toxic Free Fawkner, has voiced concerns that remnant chemicals may be disturbed and dispersed when construction is underway. One resident, Brian Snowden, said the site was “a weeping sore” that had to be fixed rather than redeveloped. Mr Snowden’s mother, Elsie Snowden led the fight to close the factory – which locals said put a stench over the entire suburb when it was open. The Environment Protection Authority in 1995 ordered Nufarm to test the site after a Greenpeace campaign focused attention on the seriousness of its contamination. Special Minister of State Gavin Jennings told the Victorian parliament in June that a test done earlier this year by the EPA had found chemicals in the soil around the former factory had not leaked off the site or into the Merri Creek. But residents were furious the tests were done only off the site – not on some of the contaminated areas that will be excavated if it is redeveloped. “New and comprehensive testing is needed,” said Moreland councillor Sue Bolton, who has led the charge within Moreland Council to stop the plan. A cluster of historical cancers in the area were reported in the area in the 1980s, and some residents believe it has never been fully explored properly. Former nurse and local resident Roma Mawby, aged in her 80s, said many children in the area used to play in Merri Creek directly at the back of the Nufarm factory. Among those to present to Moreland Council when it voted to oppose the proposal late last month was Roger Pell, principal of Fawkner Primary School. He said his school’s council believed residents in the area had been neglected for too long. The school council had directed him to make the point to Moreland councillors that, if the development proceeds, “are children going to be safe when they go to school?” Mr Pell said. A Victorian Civil and Administrative Tribunal hearing on whether the plan should proceed is scheduled for March next year. This entry was posted in Human health, Industrial on April 24, 2017 by Anthony.